Disclosure: I received these products for free as part of a review for Petco. The opinions in my review are honest and my own. In my family, the holidays have never been just a time for humans, but pets as well. Ever since I can remember, the cats and our dogs had gifts under the tree, and humans helped some of them figure out how to unwrap them. With this being Reya’s first Christmas, I am looking forward to continuing this tradition. To her, nothing is better than finding a brand new toy, especially if the humans start playing with her as well! On my search looking for the perfect toys for my pet’s holiday gift guide, I was approached by Petco, who asked if I would be willing to review toys in their holiday gifts collection. To say the last, Reya and I were very excited, especially when a big package of toys arrived for her! Looking for the perfect gift for your favorite dog? My Reya loved the Petco Holiday Gourmet Hot Dog Toys Gift Set. Personally, I thought this set was hilarious. 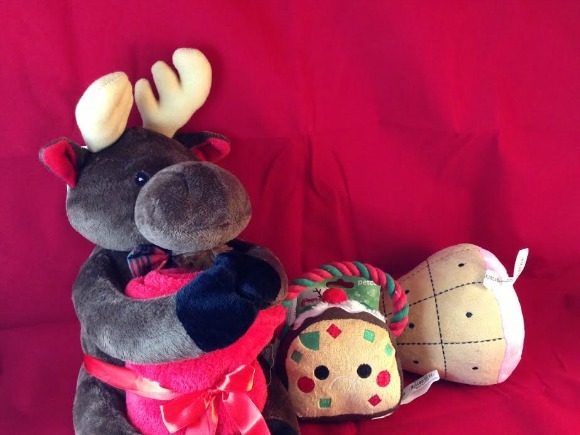 Each of these stuffed toys has a hidden squeaker and feature many popular items you would see in human food gift sets. Best of all, these toys are tough enough to survive medium and large dogs. While the picture may seem small, there was no danger of Reya choking on any of these toys. Really, this is perfect for anyone hoping to get a gift for their favorite dog or as an extra gift for your best friend’s pets! This is one of those cute dog toys that dogs love and its sadly comical for adults. Who likes getting a fruit cake? Well, this poor fruitcake is sad that no one loves it. 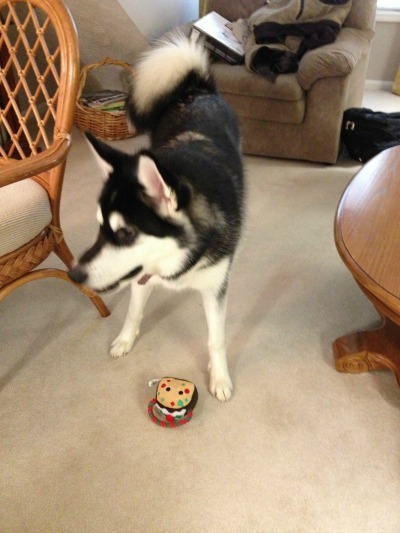 Luckily, dog is there to the rescue and will happily love this adorable toy! Reya seemed to like carrying around this fruitcake by its colored rope and then throwing it up in the air. From what I’ve seen, the rope’s true purpose in her eyes is to make it much easier for catching. With this toy’s size, it really is the perfect stocking stuffer for your favorite pup! This really is an ingenious toy, especially for pet owners who are constantly traveling. Reya is a wonderful traveler, but she does like to cuddle when she’s tired. 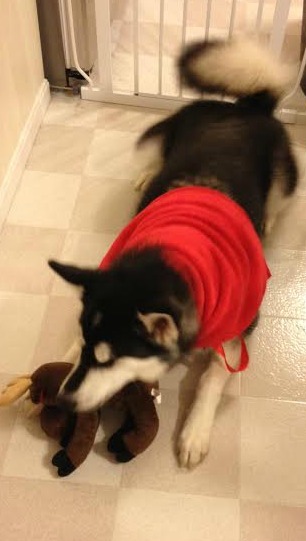 With this adorable moose, we can put a blanket over her in the car and give her a cute stuffed animal for nuzzling. While she normally doesn’t sleep with stuffed animals, she commonly uses them as a pillow while traveling, making the Blanket Combo Dog toy a great addition to our dog travel bag. If you have a dog that loves to cuddle, this toy and blanket combo is a must! Out of all the toys in the Petco Holiday Gifts Collection I had to review, this was Reya’s absolute favorite. I don’t know what it was about this toy, but Reya loved throwing this stuffed ham in the air and squeeking it with her nose. As you can see, this stuffed ham looked like your traditional, holiday ham. Maybe that is why my food motivated dog loves it so much! As a fair warning, this toy does have a very loud squeaker, so don’t plan on giving this toy to your dog if you are looking forward to some peace and quiet. Since Reya is still playing with this toy, I highly recommend it for any large dog owners! 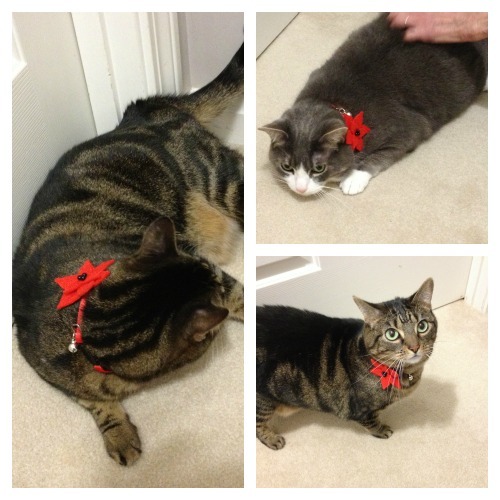 Having quite a few cats in the family, I was very excited when the Poinsettia cat collar arrived. This adorable, red collar has a cute fake poinsettia on top, making it perfect for the holidays. Best of all, the collar has a strong safety snap, allowing cats to quickly get out of it in case they do get themselves snagged. Since my kitty is usually not all that great for the camera, I modeled the collar on my mother’s two cats – Precious and Squeeky. As you can see, the collar is absolutely adorable! This collar can be found at your local Petco store! So far, everyone in my family loves all the wonderful toys available in the Petco holiday gift collection. Reya especially likes her ‘food’ themed toys and has been dragging her stuffed ham with her everywhere! Since this will be Reya’s very first Christmas, I am planning on spoiling her this Christmas and I plan on purchasing other adorable holiday themed toys from Petco. Based on our own experience with these wonderful toys, I give the Petco Holiday Gift Collection an A+ rating! Want to purchase some of these adorable pet toys for your own pets? You can find a large selection of holiday pet toys in Petco’s Holiday Gift Collection. This collection has gifts not only for dogs and cats, but other small pets that live in your home. 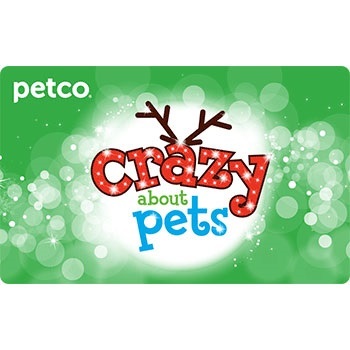 Make sure to check out Petco.com & your local Petco see the latest holiday toys! With these awesome toys, every pet will look forward to the holidays! Disclosure: Budget Earth did not compensation for this review but did receive products from Petco for review purposes. All opinions on this product are my own and may differ from our readers’ opinions. Love this!! I have 2 cats and 2 dogs, and they are like kids, and believe me, their feeling would be so hurt if no presents on Christmas! Great reviews. aww cute little idea for a gift for my dog and other family members pets!! Love it!! Thanks for sharing. Cute-my 2 dogs would have a lot of fun with these! These dog toys are very cute. Too bad that my dog tears up stuffed toys in less than a second. Still may have to check this out to keep her occupied for a while during all the holiday parties. 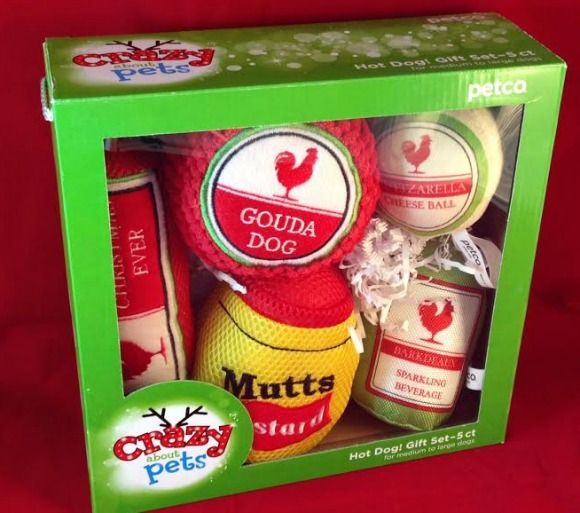 I have 3 dogs and 4 cats and they would love these Petco toys this Christmas. We always buy gifs for our fur babies too at the holidays. The pets seem to enjoy them as much as the kids. Cute gifts! I especially like the collar for the kittty! My nieces dog would love the Petco Holiday Gifts: Blanket Combo Dog Toy since she is soooo small and loves cuddling up to a blanket. What cute pet toys. I always love the holiday pet toys.